Tomas Vu was born in Saigon, Vietnam and at the age of ten moved with his family to El Paso, Texas. Vu received a BFA from the University of Texas, El Paso in 1987 and went on to earn an MFA from Yale University in 1990. He currently lives in New York City. 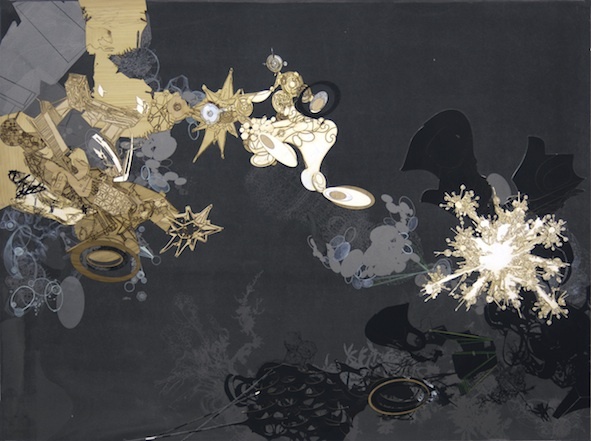 Vu has exhibited nationally and internationally and has had solo museum shows in Japan, Italy, China, and Vietnam. Most recently, he participated in the 30th Biennial of Graphic Arts in Ljubljana, Slovenia and received the Audience Award for Best Artist. He has received numerous awards including the John Simon Guggenheim Memorial Award and the Joan Mitchell Foundation Fellowship. Vu is currently faculty at the School of the Arts, Columbia University. He holds the LeRoy Neiman Professorship in Visual Arts and also serves as the Artistic Director of the LeRoy Neiman Center for Print Studies. 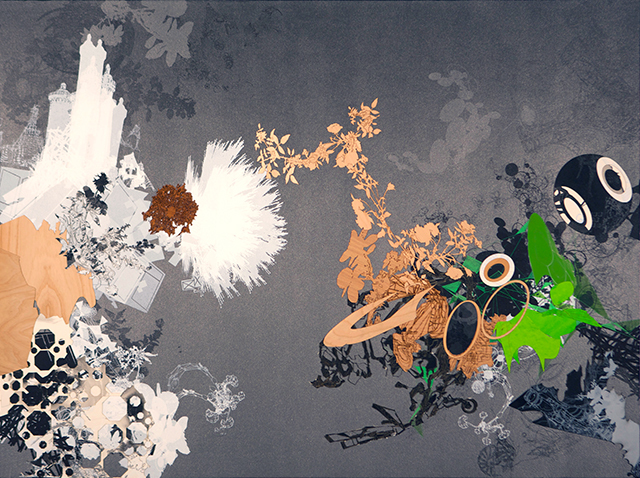 From 2006 – 2012, Vu worked at the Neiman Center to produce a serial body of work entitled Flatlands. Currently, Vu is working on the Dark Side of the Moon series, which includes paintings of various sizes as well as drawings on mylar. 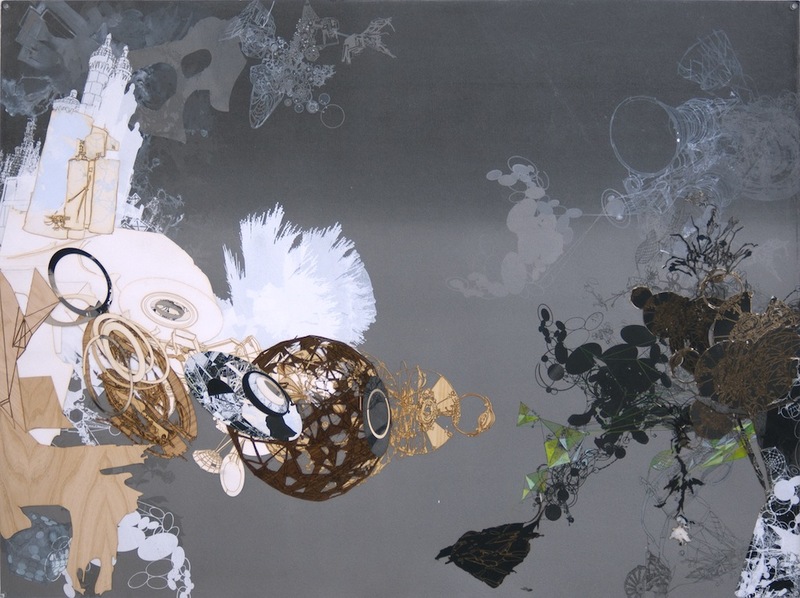 With layers of silkscreen, painting, drawing and laser engraved images collaged together, Vu creates fantastical scenes depicting cycles of destruction, decay and rebirth, as he explores nature’s capacity for both violence and compassion. A powerful source for his imagery comes from his personal memories of growing up in Vietnam during the war. Vu’s imagery describes a dystopian vision of our future, an epic clash between man and machine, nature and technology, which he sees as the defining tension of our modern era. The visual idiom of his drawings consists of layered, open spaces that evoke both topographical landscapes and gravity-less space. This cosmic space is populated with industrial detritus and efficient technologies of war that crawl in and amongst tangles of anthropomorphic and organic forms. His landscapes describe spaces where lines between imagination and memory become obscured.